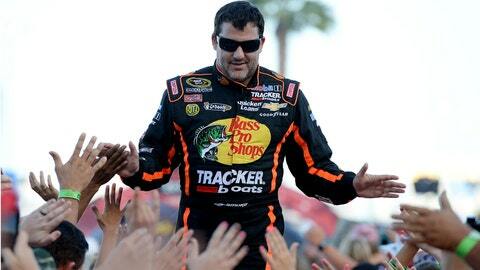 Tony Stewart is your cover boy for the ‘NASCAR ’14’ video game. Take a look. Smoke literally smoked the competition, receiving nearly one-fifth of the 700,000 votes cast in the ‘Drive for the Cover’ contest. Stewart has actually graced the game’s cover twice before, but this is the first time he’s been selected by the fans. "Being selected by the fans to be on the cover of NASCAR ’14 is a huge honor," said Stewart. "It’s been a long couple of months, but my fans’ passion has been one of the driving factors in helping me rehab and my ability to prepare for returning to the race car in February." Some of the buzz on social media focused on Stewart’s appearance. He looks … different. NASCAR ’14 is scheduled for release in early 2014. We’re hoping there’s a cheat code that lets you race in Stewart’s custom scooter.